Micromax Yu Yureka the best budget samrtphone with Cyanogen OS 11 , 64-bit 1.5GHz octa-core Snapdragon 615 SoC, 5.5-inch HD IPS display and 13-MP camera launched in India priced at Rs 8,999 which will be available from 13-January(2PM) 2015 in Moonstone Grey colour option through online retailer Amazon. While OnePlus one has launched a mid-range smartphone, OnePlus One with Snapdragon 801 2.5GHz Quad Core processor , 5.5 Inch full HD display, Cyanogen 11S OS, 13-MP Camera on 2nd Dec. 2014, Tuesday exclusively through online retailer Amazon priced at Rs 21,999 for the 64GB in Sandstone Black colour option. Both smartphone shares same platform specifications are identical to each other pricing of Micromax Yu Yureka is just half of OnePlus One. Let’s check out which is the best buy for you. The all new Micromax Yu Yureka(AO5510) supports Dual-SIM((4G+3G)),Micro SIM, Bluetooth 4.0, Micro-USB, Wi-Fi 802.11 b/g/n, GPS, and a 3.5mm audio jack speed with Cat. 4 4G LTE with up to 150Mbps download speeds and 50Mbps upload speeds supports Band 40 and Band 3 comes with a bigger 5.5-inch HD IPS display with resolution (720×1280 pixels) and a pixel density of 267ppi with Gorilla Glass 3 protection promising crystal clear wide-angle view runs on latest Cyanogen OS, Cyanogen OS 11 based on Android 4.4 kitkat and Android 5.50 Lollipop which allows you to enjoy your favorite apps from Google play and powerful 64-bit 1.5GHz octa-core Snapdragon 615 SoC (MSM8939) processor inclduing 2GB RAM, 16GB internal memory and 32GB Expandable memory. For shooting Micromax Yu Yureka packed with a powerful 13-MP rear Auto focus camera with LED Flash, Sony Exmor CMOS sensor with an f/2.2 aperture perfect for taking world-class picture in any condition while 5-MP front facing camera is the best for clicking your selfies and video calling. Micromax Yu Yureka powered by a powerful 2500mAh Li-Po battery with 25% extra power work like 3000mAh battery promising talk time up to 8 hours, standby time up to 310 hours, video playback time of up to 6 hours, and gaming up to 4 hours measures 154.8x78x8.8mm. While The all new OnePlus One supports Single Micro-SIM card single standby, 4GLTE, 3G, Wi-fi, NFC, Bluetooth, USB and GPS comes with a bigger 5.5-inch(1920 x 1080 pixels) full HD JDI screen with LTPS technology and Corning III gorilla glass delivers stunning color consistency from every any angle while Cyanogen 11S based on Android 4.4 KitKat OS and 2.5GHz quad core Snapdragon 801 processor with 3GB RAM makes your multi-tasking a fun while huge 13-MP Rear camera with IMX214 sensor with six lenses and f/2.0 aperture and 4K UHD video recording make your photography really beautiful and 5-MP front camera gives you superior video calling and selifi. OnePlus One is also powerful 31,00mAh battery promising enhanced battery life measures 152.9 x 75.9 x 8.9mm weight 190gm supports languages English, Polish, Russian, Ukrainian, Slovak, Czech, French, Hungarian, Danish, Dutch, German, Greek, Spanish, Italian, Arabic, Norwegian, Hebrew, Vietnamese, Korean, Indonesian, Brazilian-Portuguese, Turkish, Thai ,Bulgarian, Finnish, Portuguese, Simplified Chinese and Traditional Chinese. At last few honest word, the all new Micromax Yu Yureka and OnePlus One both smartphone hidden tones of features to please you. Now it’s on you what you want. Please be open to write a review. I prefer oneplus one.because it is really awesome with its performance more than yu. Superb phone under budget..know gives 2 GB ram in just 9k INR.. SImple Awesome!! 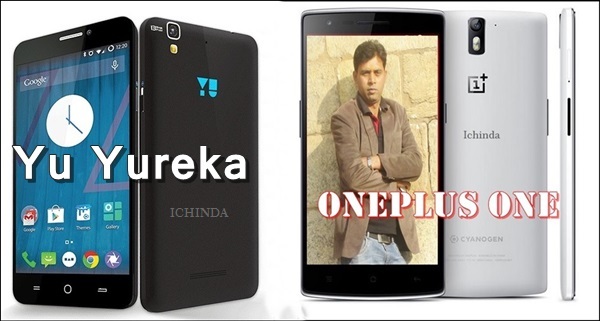 Micromax Yu Yureka is dual active phone or not..